“Throughout the 1970s I had been working mainly on black holes. However, in 1981 my intrest in origin of universe was reawakened when I attended conference on cosmology in Vatican. The Catholic church had made a bad mistake with Galileo when it tried to lay down the law on a question of science, declaring that the sun went aroung the Earth. Now, centuries later, it had decided to be better to invite a nuber of experts to advice in on cosmology. At the end of the conference the participants were granted an audience with the pope. He told us that it was okay to study the evolution of the universe after the big band, but we should not inquire into the big bang itself because that was the moment of creation and therefore the work of God. 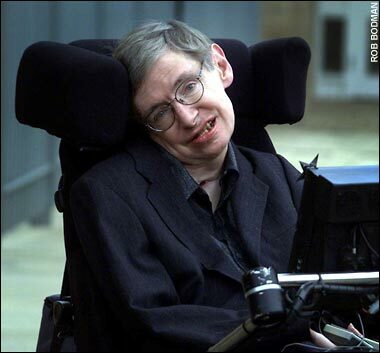 STEPHEN HAWKING is one of the world’s greatest physicists, famous for his work on black holes. His condition means that he can now only communicate by twitching his cheek. His responses to the questions are followed by our own elaboration of the concepts he describes. What has been the most exciting development in physics during the course of your career? COBE‘s (COsmic Background Explorer) discovery of tiny variations in the temperature of the cosmic microwave background and the subsequent confirmation by WMAP that these are in excellent agreement with the predictions of inflation. The Planck satellite may detect the imprint of the gravitational waves predicted by inflation. This would be quantum gravity written across the sky. New Scientist writes: The COBE and WMAP satellites measured the cosmic microwave background (CMB), the afterglow of the big bang that pervades all of space. Its temperature is almost completely uniform – a big boost to the theory of inflation, which predicts that the universe underwent a period of breakneck expansion shortly after the big bang that would have evened out its wrinkles. If inflation did happen, it should have sent ripples through space-time –gravitational waves – that would cause variations in the CMB too subtle to have been spotted so far. The Planck satellite, the European Space Agency’s mission to study the CMB even more precisely, could well see them. What discovery would do most to revolutionise our understanding of the universe? I would have a new idea that would open up a new field. « Is the Higgs Boson the God Particle or the Goddamn Particle ? happy birthday , mr. hawking. here’s wishing that you add the feather of discovering a unified field theory to your illustrious cap! !